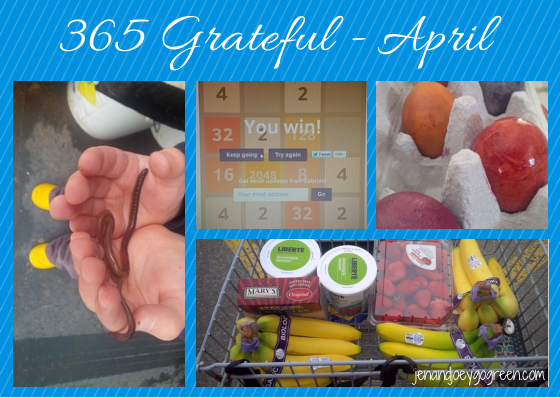 Yes, it is almost the end of May and I am just getting around to posting my April Gratitude. That's what happens when you are busy with life I guess. There were several times over the last few weeks where I logged into Blogger to start this post but then I remembered I would have to go through all my pictures to pick which ones to share. And I would always just stop there. I'm grateful that I have stopped feeling pressure to share on a schedule and instead am sharing when the mood strikes. Quality over Quantity. Or maybe it is because I needed to win 2048. I love explaining nature to B. "Do worms come out when it is sunny?" "It is cloudy....let's go find the Daddy worm." April showers meant we rescued a lot of worms from being run over. Watching your kid learn by letting them being hands on is indescribable. I am okay with dirt and mud and obviously worms. We chase toads and talk to geese. We talk about caterpillars becoming butterflies. The circle of life is awesome, especially when seeing it through his eyes. I am constantly overestimating how much I can carry when I go to the store. "I just need to pickup snack for B's class" are my famous last words. Why is it that when you skip the plastic bag and just leave the food in your cart bagless that you feel like you are stealing. I kept my receipt in my hand the entire time just in case someone chased after me. No one did but there were looks...oh there were looks. I'm grateful that I don't care about the looks or weird glances and would rather get a million of those than use a plastic bag. Dying Easter eggs was something new for us this year. I found natural egg dye at the last minute and I'm glad it was on sale because this activity held B's interest for about 2 minutes. I'm grateful that we have options to use natural products to keep our kids safe. Sometimes I feel like I exclude so much from his life in the name of this path we are on, so it is nice when I feel like we are doing something "normal". What were you grateful for in April?